Join us in celebrating the nativity of one of Old Time Radio's most beloved and recognizable character actors, Mr. Eddie Anderson. The actor so many of us love as Jack Benny's sidekick Rochester was born on September 18, 1905. In a less enlightened time, we might say that Eddie Anderson did very well for one of his races. It might even be said that Eddie would never have gone as far if not for his association with Jack Benny. To a certain extend both of these sentiments were true, but when we look at Eddie Anderson's achievements it becomes pretty obvious that Eddie would have found the opportunities and resources to do great things no matter what. Eddie was born into a show business family in Oakland. “Big Ed” Anderson was a minstrel performer and his wife Ella Mae was a tight rope performer until a fall put an end to her career. As a boy Eddie sold newspapers on the street corner. The newspaper boys believed that whoever would yell the loudest would get the most customers, but as a result, Eddie ruptured his vocal chords. This gave him the distinctive gravel voice which will always be associated with the Rochester character. The genius of Jack Benny's comedy is that everyone could get the best of Jack, but Anderson managed to bring the best out of Jack. 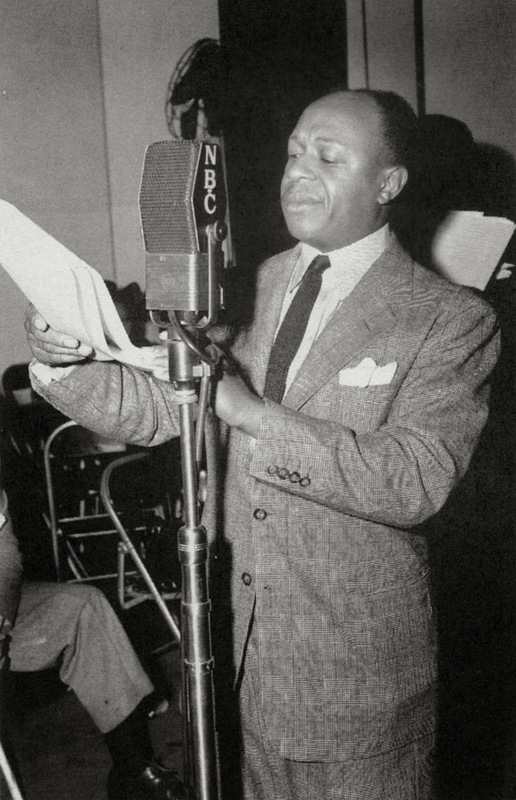 Anderson first appeared on the Jack Benny program as a railway porter in 1937. The chemistry between Jack and the Red Cap got enough laughs that he was brought back a month later (this time as a waiter, but Jack was sure to ask him if he had worked for the railroad). During this appearance, Anderson made himself at home with the cast, joining in the Jello commercial which was not usually expected of the guests. The response was so positive that Jack had the writers create the character of Rochester Van Jones to be Jack's valet. Having an African American in such a subservient role seems offensive to modern sensibilities, but it was a very common situation at the time. Although both Anderson and Benny took some flack about it, listeners realize that Rochester was anything but subservient to his boss! The character's race could not be completely ignored, but it was rarely an issue on the air. When there was a reference to it, it can from Rochester himself (like the time the gang went skiing in Yosemite, Jack told them he did not want to lose them in the snow and Rochester pipes in “Who? Me?”). Although Rochester's race was a non-issue on the air, The same could not be said when Jack took the show on the road. During the War, the Jack Benny Program was broadcast from military camps and hospitals around the country, but military segregation rules made it difficult for Anderson to appear on stage. On many of these occasions, he would interact with the cast over the telephone. There were times when he traveled with the show only to find that the hotel where the company was staying did not allow blacks. On more than one occasion, Jack had to threaten to change hotels if the policy was not changed. He made better on the threat more than once. Anderson built on his radio success with some sound (and not so sound) investments. He owned the Pacific Parachute Company which made lifesaving equipment for Army and Navy pilots during WWII. He owned a string of racehorses, including the first black-owned thoroughbred to run in the Kentucky Derby in 1947. Anderson had a lifelong interest in things mechanical, and had a custom sports car build with a one-off low slung chassis and a Cadillac engine. A Star on the Hollywood Walk of Fame at 6513 Hollywood Blvd honors Eddie “Rochester” Anderson.